When Reece Murphy is forcibly dragged into the Rose Riders gang because of a mysterious gold coin in his possession, he vows to find the man who gave him the piece and turn him over to the gang in exchange for freedom. Never does he expect a lead to come from an aspiring female journalist. 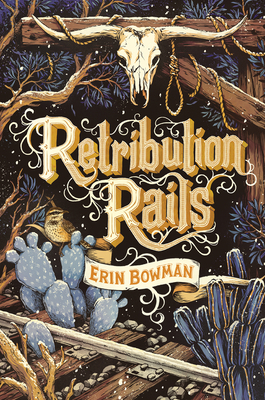 But when Reece's path crosses with Charlotte Vaughn after a botched train robbery and she mentions a promising rumor about a gunslinger from Prescott, it becomes apparent that she will be his ticket to freedom—or a noose. As the two manipulate each other for their own ends, past secrets are unearthed, reviving a decade-old quest for revenge that may be impossible to settle. In this thrilling companion to Vengeance Road, dangerous alliances are formed, old friends meet new enemies, and the West is wilder than ever. Erin Bowman used to tell stories visually as a web designer. Now a full-time writer, she lives in New Hampshire with her family and when not writing she can often be found hiking, geeking out over good typography, and obsessing over all things Harry Potter. Visit her www.embowman.com and on Twitter at @erin_bowman.